NuMedica Pan-GL (formerly called NuMedica Pan-Rx) is a powerful digestive enzyme that supports the digestive system's ability to efficiently break down proteins and carbohydrates. With its porcine-derived pancreatic enzymes, NuMedica Pan-GL can help your body effectively absorb the vitamins and nutrients contained in the foods you eat. There are various reasons why raw-pancreatic enzymes can be beneficial to take. Your physician may recommend that you take them to enhance your digestive process. Why Should You Take Digestive Enzymes? Sometimes the pancreas does not produce the amount of pancreatic juice required by our digestive systems. This juice contains digestive enzymes that help us break down food and absorb its important nutrients. If there is a blockage in the pancreatic duct or you have a condition that slows the production of pancreatic juice, you may begin to suffer from malnutrition or even weight loss. 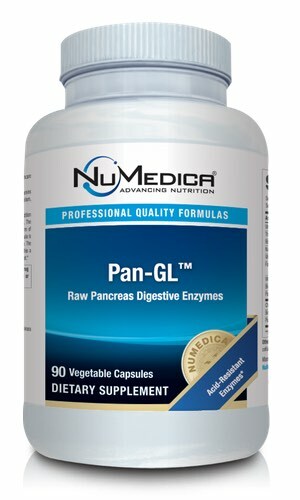 Taking a pancreatic supplement like NuMedica Pan-GL ensures that you have the enzymes you need to break down your food. 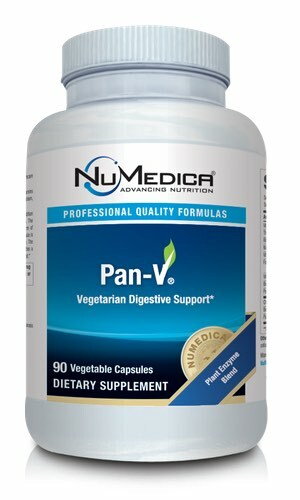 Many people find that taking a digestive enzyme like NuMedica Pan-GL can reduce the symptoms of indigestion, which can involve bloating and abdominal discomfort. Naturally, it's important to have your physician evaluate your indigestion to ensure an underlying condition is not present. Often, however, indigestion simply occurs with age. Your doctor may recommend that you begin a course of digestive enzymes to improve your body's digestive process. While many people choose not to ingest pork products because of religious reasons, it's important to note that religious organizations worldwide have made special dispensations for these enzymes that are regarded as medicinal treatments. Porcine-derived enzymes have been shown to be very effective for complementing our body's own ability to break down foods in our digestive tract. Directions: Take one capsule with or after each meal or as directed by your healthcare practitioner. Caution: Do not use if there is a prior history of or with a current peptic or duodenal ulcer. Do not use if allergic or hypersensitive to pork protein. Keep out of reach of children. Here's one simple step that will help you feel better after eating! 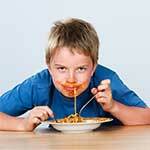 Learn more in part five of this blog series entitled Seven Tips For Balanced Living.